In 2019 I will have more guest posts aimed at informing or debating evaluation issues of importance – with an emphasis on the Global South. This is the first. Sustainable development consists of satisfying the needs of the present generation without compromising the capacity of future generations to meet their own needs, which implies achieving, in a balanced manner, social and economic development, as well as caring for the environment. Achieving this development entails unprecedented challenges in the current environment of slow economic growth, social inequalities and environmental degradation. In 2015, the 193 States of the UN General Assembly agreed on the 2030 Agenda for Sustainable Development with 17 Sustainable Development Goals (SDGs) and 169 targets. The SDGs cover the social, economic and environmental development aspects to achieve multidimensional progress, recognizing that “nothing that diminishes the rights of individuals and communities, or anything that threatens the environmental sustainability of the planet, can be considered progress”. At present the SDGs are the main reference for the formulation of policies and programmes. Many governments are reviewing how to translate these objectives into feasible but ambitious plans in order to achieve real change. For the adoption, implementation and fulfillment of the 2030 Agenda it will be necessary for the national governments of Latin America and the Caribbean to make changes in their general management processes in order to guide them towards the achievement of the SDGs. Likewise, they will have to design and implement specific social, economic and environmental policies to achieve the goals of each of the SDGs. In the framework of the 2030 Agenda, evaluation plays a crucial role since it will allow analysis of achievements, existing problems and success factors. One proposal to evaluate the adoption, implementation and compliance with the 2030 Agenda by the national governments of Latin America and the Caribbean, is to combine the cycle of Managing for Development Results (by that I mean strategic planning, results-based budgeting, financial management, program and project management, and monitoring and evaluation) with the public policy cycle (which consists of design, implementation and results, i.e. outcomes and impact). This integrated approach implies that governmental action has to enable transition from the macro level of managing for development results to the micro level of specific public policies, as highlighted in the accompanying figure. Under the logic of the proposed integrated model, three main types of evaluation (of design, performance and impact), and seven principles that can guide the evaluations (relevance, effectiveness, efficiency, economy, impact, sustainability and equity), can apply to all processes of the public management cycle and to all phases of the policy cycle. This model also makes it possible to determine on which aspects the evaluation of the adoption, the instrumentation and the fulfilment of the 2030 Agenda can focus. However, for the evaluation to have an impact on the improvement of the programmes implemented to achieve the SDGs, it is necessary for government entities to stop perceiving evaluation as an instrument that threatens their work and that does not provide useful information of value to society. Instead, evaluation should be perceived and conceived as an ally that promotes learning and continuous improvement. 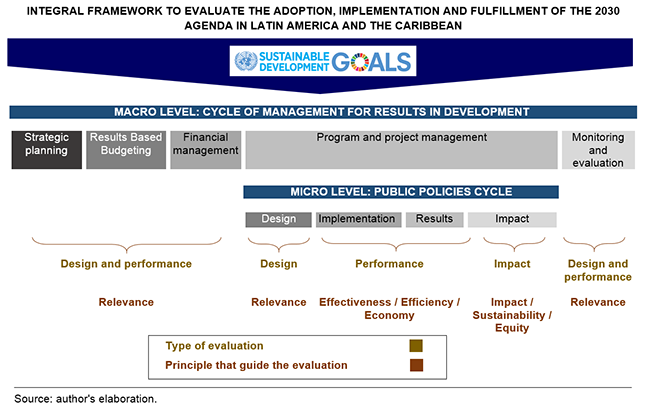 The Voluntary Organizations for Professional Evaluation (VOPEs) of the different countries of Latin America and the Caribbean can also have an active role with the purpose of exchanging experiences and constructing learnings about the evaluation methodology and its usefulness in the analysis of the achievement of the SDGs. Finally, it will be important that the evaluations carried out within the framework of the 2030 Agenda be subject to the evaluation standards of the Monitoring, Evaluation and Systematization Network of Latin America and the Caribbean (ReLAC) – rigorous evaluation; adequate evaluability; evaluation conducted in accordance with ethical and legal principles; adequate cultural understanding; relevance; and usefulness. « Evaluation for Transformation 3: What do you count as “success”?